Wake In Progress: Page 18: what curios of signs in this allaphbed! Can you put this up for sale? I'll buy a copy. Funny, I was on the verge of asking you to put the 1st draft up for purchase. At first, I regretted the loss of the green inkspot as a tree, and the black inkspot as a smoke cloud from a stack in the first version. But you've re-conceived them (symbolically even!) in a more interesting way in this version. Great work. This has always been my favourite (all three versions now, this one being the best yet). Thank you both! I’ve always been very proud of the concept of this one, but I was never quite happy with the execution. Thank you Stephen. 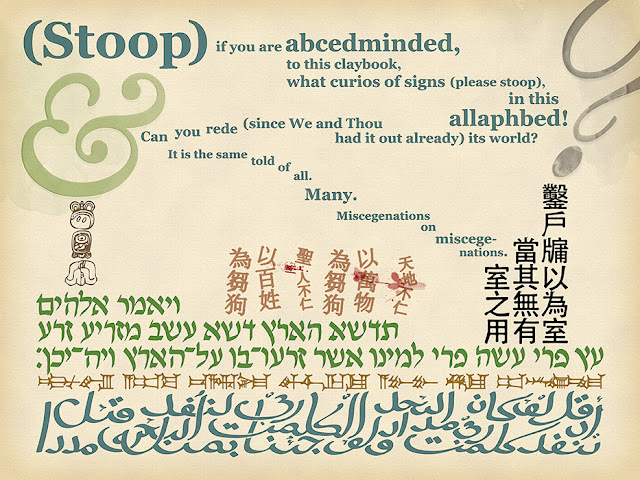 Just ordered the Stoop... print, along with the last/first page print, which was only available in a small size. Looking forward to getting them mounted once they arrive. should read ויהי-כן instead of ויה-יכן, i.e. the yod (י) should be moved to the left of penultimate word from the left(i.e. immediately to the right of the maqqef, a hyphen-like horizontal line). Hope this helps; it's a great piece! Ugh, I knew it! The lesson is, never try at anything. Or proofread.